When traveling, a nice thing to do in your hotel room or in the room of a house your a guest of is to have a slide show running of scenes from home and family members. This can be relaxing to some, and others find this to only make them that much more home sick. A alternative to that we have found is Magic Window. This universal app will run full screen on the iPad or iPhone. The backbone of Magic Window is 20 stunning scenes (Sunsets, sunrises, cities, mountains, beaches, and coast) that are almost ‘alive. Elements move, the sun rises and sets. Each of the scenes are downloaded for free so you only have the ones you want to keep the size of the app down. 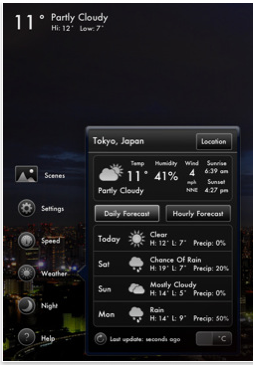 Magic Window also includes an Alarm Clock, Sleep Timer, Live Weather Conditions, and Daily and Hourly Weather Forecasts. All of the above features are highly adjustable to match your needs, including how fast the sun sets. Tune to match how you want Magic Window help you relax. 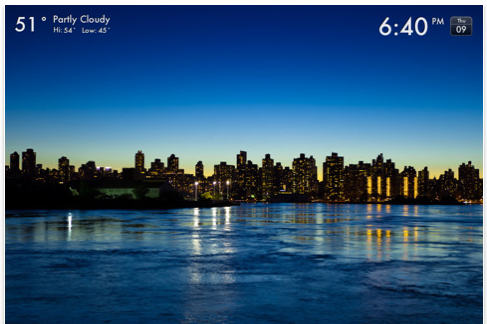 When in the ‘night’ mode (sun set), the clock numbers size increase so you can see them easily at night. It’s nice to have the same app be an alarm clock and tell you what the local weather will be for the day. Or, what the weather is like back home. Give your iPad something to do on the night stand when traveling with Magic Window.